Ebola Virus Outbreak research papers examine the recent outbreak of the Ebola virus in West Africa and the first outbreak in the United States. Research papers on the Ebola virus outbreak look at where the virus began and the countries that contain the virus. 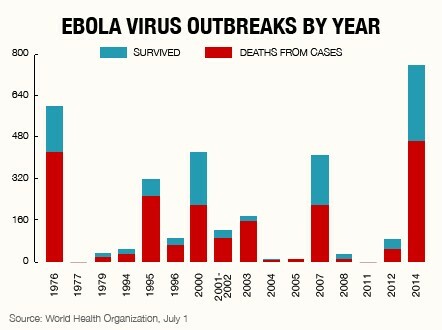 The Ebola virus was first identified in 1976, but the 2014 epidemic quickly exceeded the number of victims for all other outbreaks combined by September. Researchers believe that the death of a 2-year-old boy in December 2013 in a Guinea village represents patient zero, of the index case, of the current outbreak. The boy’s mother, sister, and grandmother then became ill with the disease and died. The disease then began spreading to other villages. Previously, Ebola had not been reported in West Africa, and the virus largely went undetected until March 2014, by which time reports of Ebola were reported in both Sierra Leone and Liberia. On 30 September 2014, the Centers for Disease Control (CDC) reported the first case of Ebola in the United States. A man who became infected in Liberia returned home to Texas. When he first reported to the hospital, he was sent home with antibiotics before reappearing at the hospital four days later. The man later died and on 12 October 2014, it was announced that a healthcare worker at the Texas hospital contracted the Ebola virus as well. Ebola Symptoms and Treatment - Ebola Symptoms and Treatment research papers discuss the severe disease that causes a hemorrhagic fever that can be fatal to humans. Bacteria - Bacteria Research Papers discuss how bacteria forms, and the evolution process for bacteria. Blood borne Pathogens - Bloodborne Pathogens Research Papers delve into the illnesses that come about from bloodborne pathogens. East Africa research papers examine east coast of Africa and the greatest influence of this nation the Arab Natives. Paper Masters writes custom research papers on Ebola Virus Outbreak and examine the recent outbreak of the Ebola virus in West Africa and the first outbreak in the United States.